This Philips beard trimmer comes with length settings that range from 0.5mm to 10mm making it very useful no matter whether you want to maintain a clean-shaven look or a neat beard. The trimmer is designed with titanium coated blades that provide a superior cutting performance. This product is available in Snapdeal, Flipkart, Ebay, Infibeam. 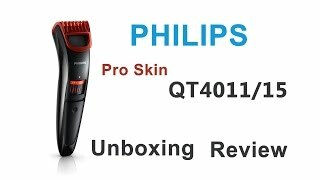 At snapdeal.com you can purchase Philips QT4011/15 Pro Beard Trimmer Red & Black for only Rs. 1,979, which is 7% less than the cost in Infibeam (Rs. 2,127). 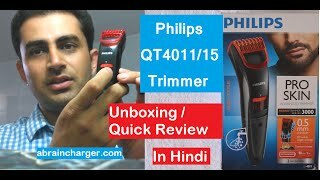 The lowest price of Philips QT4011/15 Trimmer was obtained on April 25, 2019 10:15 am. Good product. i bought the model having Titanium blade.Which are sharp enough and long lasting edges. price seemed on higher side w.r.t market availability. Front plastic attachment must be provided additionally with new pack for future use. Its good product.But I want to see later performances..Its delivery before fore days..that is good.. This is great. I bought this product 2 days back from cloudtail india. As i felt extra sound coming from it so i returned. Replacement reached me within 24 hours which i feel great. Don’t expect it to be so accurate with its level but worth for the money. I have been using this for 2 years now, and it’s working perfectly fine. Works as described. Seeing how much time a normal shave/trim can take, this is good for around 6-8 times without charge. After usage of six months i’m writing this review the Product is so good. You can buy this product without making any second decision.I Have placed two orders both of them are good.